Every Chief Executive from George Washington to George W. Bush has had a woman by his side in the White House—usually a wife, but sometimes a daughter or niece or friend. These women served as hostesses, advocates, ambassadors, and champions of causes. They offered the President shoulders to cry on and counsel to rely on. And though their job has no description, they do have an impressive title. They are our country's First Ladies. The lives of the First Ladies are varied and compelling. Legendary stories such as Dolley Madison's rescue of White House treasures during the War of 1812 sit side by side with lesser-known anecdotes such as Julia Grant's 29-course White House dinner. Many First Ladies embraced causes for which they worked tirelessly. Lady Bird Johnson called for the beautification of cities and highways while Hillary Clinton campaigned for children's rights. Eleanor Roosevelt stands as the most impressive example of the publicly active (and activist) First Lady. On her husband's behalf, she spoke at the Democratic Convention, traveled all over the country and the world, supported causes from civil rights to labor rights for women, and held more than 300 press conferences during her 12-year tenure. 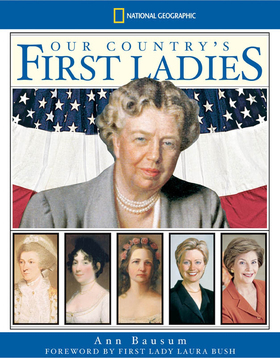 First Ladies today follow many of the traditions established by their predecessors and often blaze new ones. Each finds a way to make her mark—whether through a redecorated White House or actual policy-making. The platform of the First Lady is a powerful one: Through it one woman can make a difference in America and the world. Award-winning author of history for young people, Ann Bausum captures both the public personas of America's First Ladies and the women behind them in this fascinating collection, Our Country's First Ladies. Idea. Research. Writing. Revising. Those four steps compose the core tasks for any work of nonfiction. But an author's work doesn't stop until one more step is completed: Production. In my experience, the first four steps are pretty solitary—although I do collaborate with my editor on ideas and manuscript revision. Production, though, is like a family affair. Suddenly friends and allies pop out of nowhere to transform my typewritten manuscript and illustration ideas into a beautiful book. After all those months of solitude, I feel like I've walked into a party. Everyone's excited. Creative minds add their ideas and inspiration to the raw materials of text and images. We swap e-mails and brainstorm with conference calls. Sometimes I'm even able to visit my publisher in person and take part in face-to-face planning sessions. Six to nine months will elapse before our efforts are rewarded with printed books. What follows is a summary of the tasks that lead from manuscript to printed page. Format. Publishers often set the format for a book—how long it will be, whether it will be printed in more than one color, and what its finished dimensions will be—when they first commit to do a project. Such plans help the publisher budget for the costs of the book and anticipate its production. They help me, too. Before I write a single word of a book, I already know how many pages of space I will have for my text, about how many photos we will use, and the finished size of the book. These facts help me imagine how the book will look and anticipate how best to share my subject with readers. Materials. I start off the production process by submitting my text to my editor. My editor reviews the work and offers suggestions for improvement, then I make any necessary revisions. Often I am responsible for photo research, too—finding ideas for the book's illustrations. (See the BEHIND THE SCENES—PHOTO RESEARCH tab of Muckrakers to learn more about this process.) Sometimes someone else does that research, as was the case with Our Country's First Ladies. 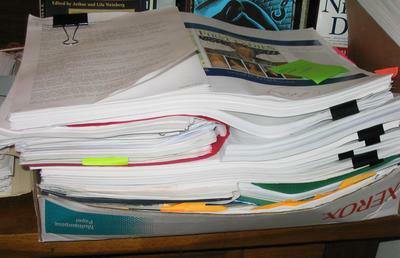 Either way, we submit photocopies or low-resolution scans of our suggestions, and these are critiqued, too. The editor then shares this material with the person who will design the book and with other staff members. We help make up the production team for the project. Some publishers, including National Geographic, list those team members in the credits of each book. You can find the production staff listed for Our Country's First Ladies on the last page of the book, for example. That long list helps convey how many different hands go into making a children's book. Schedule. With each book, we break the production process down into numerous steps and assign a deadline for accomplishing each one. We don't meet every deadline, but we make up time where we can and try to keep the book on schedule. I may be collaborating with this staff on one book, but at that same time they are working on many other books. Sticking to schedules helps keep all of these projects moving forward. Book jacket design. The saying may be that "You can't judge a book by its cover." Even so, publishers devote a tremendous amount of time to the design of a book's cover, or jacket. The book's designer reads my manuscript, reviews illustration ideas, and conducts her own research before she starts her design work. She may visit museums, look at books and magazines from the period, and explore resources on the Internet. What typefaces were popular in a particular period? What colors? How did people decorate their homes? What did they wear? All this background knowledge helps the designer create a feel and look that is unique and appropriate for each book. She may create several distinct ideas for a jacket that will go through numerous rounds of critiquing and revision before the final design is approved. Interior design template. The jacket helps set the tone for the interior design of a book, but the designer faces many decisions, even so. What typeface should be used? What colors of ink and paper? Will photographs "bleed" off the pages (that is be printed to the very edge of each page as opposed to being bordered by clean paper)? How will each chapter begin? Where will photo captions be placed in relation to illustrations? What design elements will tie the book together—colors, type, illustration motifs? The designer uses ideas for all of these elements to create a suggested template for how the book will look. Often she chooses one chapter of a book, threading the provided text and photo ideas into a proposed design. The production team offers suggestions and ideas, and the design template goes through a series of revisions until everyone is satisfied. Proofs stack up as the production process continues. Preliminary layout/first pages. Once the template is set, the designer applies its guidelines to the rest of the book's content. After consulting with the editor, she paces the text and illustrations into spreads (pairs of pages that appear side-by-side when readers open the book). Again she faces many questions and decisions. How much space should be set aside for front matter and back matter (the pages that surround the main text—like the title page, table of contents, bibliography, and index)? Will the main text fit? Where do we have too much text? Where do we need more? How often should illustrations appear? When do we need a horizontal image, a vertical one, or a full-page illustration? How about a close-up photo or a panorama? The photo research includes extra image choices so that the designer has plenty of options. Then team members critique the preliminary design. Illustrations. At this point the person responsible for photo research (often this is me) collaborates with the staff illustrations editor on gathering final images for the book. The designer's preliminary layout shows us what we'll need to order. Sometimes we obtain high-resolution scans; sometimes we order prints or slides. We verify our rights to use the material and pay any fees associated with reproduction. This step involves lots of paperwork! We maintain a spreadsheet and log of all the images, their sources, etc., to help us keep track of what has been ordered, what has arrived, and what paperwork is left to do. Second pages. Meanwhile the designer incorporates all the feedback from the preliminary layout into a revised layout called second pages. The designer will place "dummy" text—meaningless words that fill incomplete parts of the text—to show where real text needs to go. It's my job to write this missing copy (the space for photo captions is often shown as dummy text, for example). I help cut the text if it runs too long somewhere, as well (such as at the end of a chapter page). I read the book all the way through—my first read of the typeset text. I'll always see ways to change and improve the text when it appears in this new format. Dummy show. All those changes and updates are compiled and entered into the master computer file for the evolving book. Now the book begins to look more complete, and it's time to share it with others for their input. Many people are invited to comment on the evolving dummy, or proposed design, of the book. At an appointed time, staff members gather for a dummy show where they can see full-color printouts of all the book's spreads hung on a conference room wall. Fresh eyes inevitably see things from a new perspective, and ideas emerge for ways to improve the book even more. It takes a team to make a book. 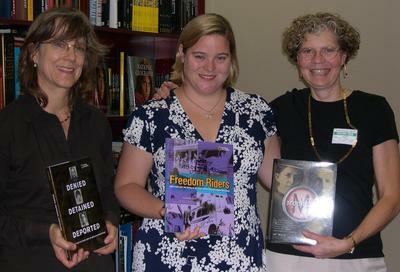 Key participants include the book's designer and its editor (above, from left, designer Marty Ittner and editor Jennifer Emmett join me with a display of some of the books we've created together). Proofreading. More people begin to read the book, too, from other editors and staff members to fact checkers to outside consultants to copyeditors. An indexer begins to compile the data for the book's index of page references. My editor and I read the book carefully, and I respond to everyone's suggestions for how to polish the content. Several rounds of proofs follow, each one addressing the concerns found in the previous proof. Sometimes new changes occur late in the process; sometimes we just verify that we've corrected old errors. Fresh eyes study the text to make sure those of us who know it so well aren't overlooking any mistakes. I read each proof, too. I'll have read the text of the evolving book a half-dozen or more times before the production process is completed. Printing. Once everyone is satisfied that all changes have been made, the computer files for the book are released for printing. Another subset of steps unfold. Someone has already tested the color scheme for the book and prepared the illustrations for reproduction. Now everything merges into a printer's proof, and staff members read every word of the book again to make sure no new errors have occurred during this final phase of the production process. Only then do the presses roll. Later on the printed press sheets are folded and gathered into sets of pages. Then, finally, binding equipment stitches them into the final book form. By the time I receive my first copy of the book, I'm probably already immersed in the research and writing for another project. Weeks may have passed since my last e-mail or phone call from the production team. Yet each time I've heard from someone, I've shared in our excitement of creation. There is such joy in collaboration. It's as if we were scheming about a wonderful present, lovingly making and wrapping it to share with a special friend—with you, our readers. When I receive my first copy of the book, I take a deep breath before I open it. Will it look just like we'd imagined? After I've turned every page without finding any surprises, I give a sigh of relief. All those steps have paid off, and we've created the best possible book—just the way we planned it! In Our Country's Presidents and Our Country's First Ladies I've tried to breathe life into each of the men and women who have served our country as chief executive and first lady of the land. These books are chock-full of stories, engaging facts, and unexpected details of human interest. Illustrations, stories, facts, and figures draw children into the story of our national leaders and our nation's history. Length: 40 minutes, 10-15 minutes for questions. Technical requirements: LCD projector and projection screen. "Content was very appropriate for the grade levels. The trivia will be remembered as a favorite moment, I'm sure....It was a wonderful day, and we'll be talking about it for quite a while!" " author came early and made sure all the tech equipment was set up properly....After the talk, you wanted to go out and buy the books. I would love to have her visit our school....Ann is very personable." "From Martha Washington to Laura Bush, this readable reference book traces how first ladies play their parts as trailblazers, activists, consultants, hostesses or helpmates. One has to wonder what kind of spousal support Hillary could expect from Bill should he become 'First Laddie.' A new chapter would have to be written."